Recent advances in experimental techniques allow one to measure and control systems at the level of single molecules and atoms. Here gaining information about fluctuating thermodynamic quantities is crucial for understanding nonequilibrium thermodynamic behavior of small systems. To achieve this aim, stochastic thermodynamics offers a theoretical framework, and nonequilibrium equalities such as the Jarzynski equality and fluctuation theorems provide key information about the fluctuating thermodynamic quantities. We review the recent progress in quantum fluctuation theorems, including the studies of Maxwell’s demon which plays a pivotal role in connecting thermodynamics with information. The authors thank Y. Masuyama for providing a cartoon of Maxwell’s demon in Fig. 10.3. K. F. acknowledges supports from the National Science Foundation of China under Grants No. 11375012 and 11534002, and The Recruitment Program of Global Youth Experts of China. M. U. acknowledges support by a Grant-in-Aid for Scientific Research on Innovative Areas Topological Materials Science (KAKENHI Grant No. JP15H05855). T. S. acknowledges supports from JSPS KAKENHI Grant No. JP16H02211 and No. JP25103003. 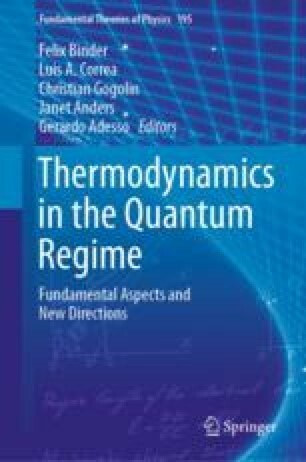 Part of the research reviewed in this chapter was made possible by the COST MP1209 network “Thermodynamics in the quantum regime”.